David Jaffe wants developers to demand better contracts from publishers or improve themselves to the point that they can. It's a common belief amongst many gamers that publishers are evil. We're not even talking mildly evil either, like someone who steals the coins from the Leave-A-Penny tray at the checkout. Videogame publishers are supposed to occupy that strata of wickedness reserved for the likes of Sauron, Joffrey and that creepy kid from The Omen. They exist only to squeeze money from the hopes and dreams of unsuspecting developers, whose one simple desire is to make a good game. Recently, an anonymous designer wrote an editorial decrying things like unfair publishing contracts and inept and uninterested management trying to force bad ideas where they don't belong. 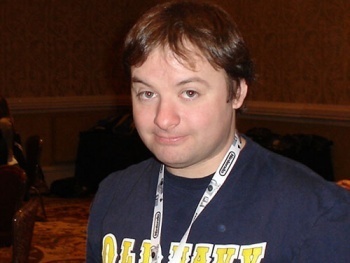 In response, God of War-creator David Jaffe has told developers to quit whining. "I reject the tired accusation that it's the publisher keeping game developers down. And I reject that accusation because of the classic line that I am sure you've heard before: you are worth what you can negotiate," said Jaffe, writing on his personal blog. "Don't like the way a publisher treats you? Don't sign a contract with that particular publisher. Or if you do, make sure you have what you will and won't tolerate written into the contract. And if your studio is not good enough to demand better deals and is not clever enough to secure alternate forms of financing (thus allowing you to bypass the publishers all together) then you deserve what you get." Jaffe isn't unsympathetic to the travails of modern developers, but he nonetheless urges them to take steps to regain control of the development process and improve their clout in the industry. "You want to be treated better? Sign a contract demanding it. You are not able to get such a contract? Then improve your team until you can demand in the real world what you think you are really worth in your mind. Because at the moment the real world is making something very clear to you. And that is this: For the time being anyway, you are not as good as you think you are."